Dexter Season 3 Episode 3: "The Lion Sleeps Tonight"
Dexter: (voice over) This is absolutely, without a doubt, the worst moment of my life. Yoga teacher: Now let's go into a little free form yoga. Just let yourself dance. Dexter: (voice over) I was wrong. This is. Yoga teacher: See the dust dancing against the sunlight. Be as beautiful as the golden flakes of dust Dexter. 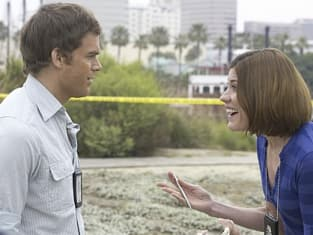 Dexter: (In his head) I could probably kill her before anyone realized what happened.